In 1976, leaders of the Calgary Region of the Canadian Mental Health Association (CMHA) recognized a need for innovative housing for their clients and so created the Hari Housing Society, later to become Horizon Housing. The idea was sparked when a proposal for a group home was met with intense opposition from community members such that they were not prepared to welcome a stand-alone house with mental health clients as its residents. The opposition became a significant turning point for the Executive Director of CMHA-Calgary at the time, Ron LaJeunesse, and fellow Board members such as Darol Hamilton, Jim Rice, Aleck Trawick, Barry Pendergast, Gerald Pulak, Hugh Thorsten and Keith Werry. They conceived of a better housing model; one in which individuals with mental health challenges were integrated alongside people with other needs such physical disabilities and even with members of the broader community. And so a new organization was established to develop an apartment building to execute this progressive model. 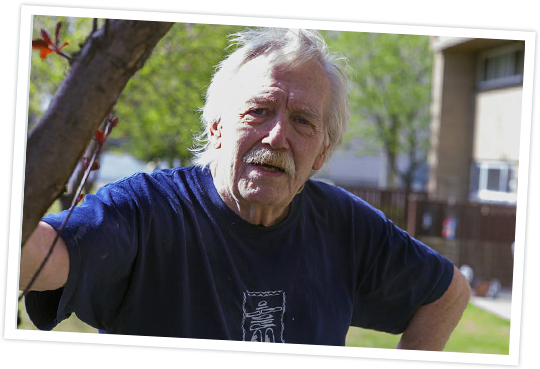 The name Hari Housing originated from a blend of the last names of Darol Hamilton and Jim Rice in recognition of their years of service on the CMHA-Calgary Board and belief in this new way forward. It was the group’s ambition that vulnerable Calgarians be provided with affordable housing that would blend in with the surrounding community. They believed this new model would help reduce the stigma attached to any particular group and would also promote acceptance and integration into the wider community. In the early days of the Society, Canadian Mental Health Association – Calgary Region was Horizon Housing’s sole partner. Over time, as the need for supported affordable housing grew, the Society extended its partner network and today collaborates with over 20 support agencies. These agencies deliver a wide range of programs and services. As individuals make homes with Horizon Housing Society, the agencies ensure families and individuals have the support they need to be successful in making their homes with us now and in the future. As we’ve expanded our network of referring agencies, Horizon Housing Society has also grown to serve tenants with a wide variety of special needs: individuals living with mental health challenges, physical disabilities, brain injuries, families and seniors living below the poverty line and the working poor. We are proud to provide residential rental housing that is appropriate, affordable, integrated and supported. Horizon Housing Society promotes a mixed-use concept for our apartment residences, which helps reduce the stigma attached to a particular group. This model promotes community integration and acceptance while enhancing the quality of life for our tenants. Horizon Housing Society is a registered charitable organization serving over 700 tenants. We own and manage 16 residences (8 supported homes and 8 apartment buildings) in Calgary. With a focus on helping our tenants and people achieve success, using resources wisely and building collaborative partnerships with our community, Horizon Housing Society will continue to serve people in need for years to come.